There's no BD-Live functionality here, but do you really want it? The latest Blu-ray player from Pioneer is another inky black slice of high-def home cinema to match the brand's Kuro plasma TVs. However, despite its size and premium styling, the Pioneer BDP-LX71 isn't the ﬂagship model and controversially, it doesn't even have an Ethernet port. Partly due to timing, but mainly because it was decided that BD Live simply wasn't worth the compromise, Pioneer has pressed ahead with a high-quality playback machine promising outstanding picture and sound quality, onboard HD audio decoding, and full 7.1 channel outputs. The Pioneer BDP-LX71's front panel looks supremely stylish with just two silver buttons punctuating an otherwise smooth high-gloss plastic fascia. It's not until you power up the electric blue LED backlights that the display, disc-drawer and touch-sensitive buttons become apparent. It's at least four times the size of Sony's latest BD decks, which only adds to the sense of esoteric quality. It has a high-end feature-set to match, with a DeepColor-capable, 1080p24-toting v1.3 HDMI port and variety of preset video out options that optimize the signal to suit each display technology. The eight analogue multichannel outputs won't be of much interest to anyone with an AV receiver equipped with HDMI v1.3 switching, but it's great news for anyone with a legacy receiver that either has no HDMI port – or an earlier version that can't cope with a 1080p signal – because it means that you can wire up the eight analogue outputs to hear the uncompressed 7.1 PCM soundtrack on BDs like 3:10 to Yuma. There is a caveat, though: the LX-71 is currently not capable of decoding of any DTS-HD Master Audio soundtracks, and so you won't be able to get HD audio from some software (notably 20th Century Fox titles) until you get that new amp, or until Pioneer releases the promised ﬁrmware update to resolve the issue. There are more reasons to be cheerful when you prize open the LX71. Pioneer's double-layer steel chassis provides extra rigidity and isolation, while the audio, video and power handling circuitry are all separated off as far as possible to minimize internal interference. This adds up to a very low audio jitter reading in our Tech Labs and an excellent all-round performance. Pioneer claims that it's 'a brand that is constantly meeting the needs of high-proﬁle cinephiles' – and cites the BDP-LX71 as proof. And, to be fair, cinephile performance is what this deck is about; there's little else in the way of additional gimmicks. Pioneer has dismissed BD-Live as expendable, and having persevered with the interactive content on BDs like Men in Black, I'm inclined to agree. There's no USB interface and no memory card slot either. Instead, this deck's feature set is all about improving the picture, and it works. The picture from the 3:10 to Yuma Blu-ray disc is rock-steady and completely free from onscreen noise and artifacts. With 3:10 To Yuma it's obvious how faithful the Pioneer's playback is. The blistering detail of the desiccated ranchland comes across in vivid detail. Some of the daytime scenes look a little bleached out, which is intentional, and the Pioneer copes with the dazzling sunshine without whiting out completely. The dynamic contrast and natural colour handling of the LX71 are joined by an ability to deliver a remarkably pure white. This deck makes a very strong case for hanging on to your DVD collection, too, producing a very full and vibrant upscaled picture from regular DVDs that usually look a bit soft and ﬂat after Blu-ray. Pioneer takes it's audio seriously and although this model wasn't ﬁne-tuned at the famous AIR studios in London, like the cream of the brand's product range, it does sound highly reﬁned. The analogue outputs are no afterthought and you can listen through these without audibly polluting the sound. There's no SACD or DVD-A compatibility sadly, but for stereo listening, there's another pair of analogue outputs available that offer an even more direct route for the audio signal, so it'll sound like an entry-level audiophile CD player too. So: no BD Live compatibility, SACD/DVD-A playback, USB and media card ports, or DTS HD Master Audio decoding. 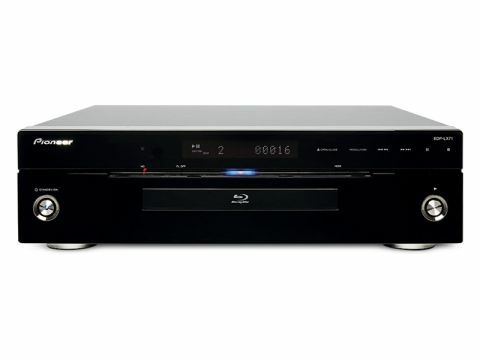 But even without the extras, the Pioneer BDP-LX71 represents an compelling purchase for home cinema enthusiasts keen to take the Blu-ray plunge right now.